This article was published originally in The Reliquary, Vol. 2, 1861-2; pp219-226. ALMOST every village and hamlet in "merrie England", now has, or has had, its ancient hall or manor house, and in the Peak these former homesteads of the old English gentry are very numerous. In them formerly dwelt the territorial possessors and owners of the land, the warriors and worthies of the olden time. In them the Crusaders and Cavaliers were born and bred, and they were the seats of feudal hospitality, of rural plenty, and of festive mirth. It is, however, much to be regretted that of a great number of these "precious relics", and landmarks of the days that are past, scarcely a vestige remains. Some are crumbling away with age, and are in a rapid state of decay; others are the habitation of the farmer or labourer, while but few are now occupied, or even possessed, by the lineal descendants of their original founders. Connected with most of the families and denizens who have from time to time tenanted these venerable halls, are historical associations or tales of local or more general interest, and where these are wanting, legend, tradition, or romance, seldom fails to furnish events and incidents, always found linked with the rural hall, or country residence. Hence, they are always regarded with attention by the local antiquary, and furnish rich materials for the student in genealogy or family history. These quaint old gabled houses, ever varying in their architectural detail, diversify and beautify the scenery around them; like gems, or brilliants in the coronet, they strike the eye of the tourist, and impart a vivid and peculiar charm to the landscape. Views distant Winhill, Mam, and Kinder Scout." Bradshaw Hall is situate on rising ground, a short distance from the roadway. It is four stories high, and commands an extensive prospect over a large sweep of country to the south. The view is bounded by Bleak Low and Longstone Edge; while to the east is Riley, with its shelving woods, and its famed "Riley Stones", and stretching a little farther are the romantic and turreted crags of Rock Hall. The ruin itself, grey with age, when seen from a distance, presents a rather lofty and imposing appearance, and conveys to the mind of the spectator some idea of the opulence and influence of its former owners. The main portion of the structure now standing (as will be seen by the sketch), forms a square measuring twenty-two feet by twenty-five feet. Attached to the north-west angle, is an erection of inferior dimensions, probably formerly used as a kitchen, or other office, now converted into a cow-house ; it is a two storied erection, but the first floor is destroyed. This, as well as the other part, is in the Tudor or Elizabethan style, and is constructed of the durable, though soft, sandstone from the neighbouring moorlands. The courses in the walls are seven or eight inches in thickness, and the masonry extremely good. The windows on the ground floor, which light the principal apartment, are large. There are two in either front - south and east - and they are divided by mullions and transomes. All the windows in the edifice have labelled heads with knees. In the crenelle in the centre of the upper tier of windows, on a circular stone, is carved in bold relief, and in good preservation, the crest of the Bradshaws - a stag at gaze ppr., standing under a vine fructed ppr. The principal floor in the square building, formed one large apartment, which being light and pleasant, was probably intended as a hall or reception-room, though it had no main outward entrance. It contains a noble fire-place, the mantle and jambs recessed and enriched with a deeply indented moulding. Above this room were two other floors now removed, and beneath were the cellars. The whole is now greatly dilapidated and used as a barn. The part now standing is said, on reliable authority, to have been erected by the Bradshaws just before the plague broke out at Eyam. They, in order to escape the fury of the pestilence, removed to Brampton or Treeton, in the county of York, and never returned to reside at Eyam. Owing to this circumstance it is believed the building was never completed. It was intended to be hung with tapestry, which came to the place but was never put up. An old man who was born in this part of the Hall, informed the writer that when a child he saw "the tapestry lie in a heap in a corner of the chamber, where it rotted away". About 70 years since the cotton manufacture was introduced into Eyam. At that time the largest portion of the Hall belonging to the Staffords being ruinous, was pulled down, and the remainder, as built by the Bradshaws, converted into a cotton factory, worked by horse power. During this occupation the place narrowly escaped destruction by fire, and the blackened and charred lintels, beams, and rafters, still to be seen, afford ample evidence of their contact with the destructive element. Judging from the extent of the foundations removed some years since, the Hall of the Staffords, the predecessors of the Bradshaws, must have been an extensive building. Before its destruction it had been converted into small dwellings inhabited by miners. The whole had a flat roof covered with lead. One room was said to have been very large, the beams ornamented with carvings of shields of arms, and a fine traceried window looking east. In the room was a large shovel board of massy oak. Tradition informs us that a very large establishment of servants was maintained by the Staffords, and this is partly corroborated by a large baker's oven which was destroyed some years ago. Of the out-offices the butcher's shop only now stands; in this they slaughtered the meat consumed in the house. Very little is now known of the history of the once great family of Stafford, who for some centuries resided here, and even tradition is almost silent respecting them. Rhodes, in his Peak Scenery, says that the Eyam estate descended from King John to a family of the name of Stafford, for military services, on the express condition that a lamp be kept continually burning before the altar of St. Helen, in the church at Eyam, but unfortunately, he does not cite his authority. An old tradition of this kind still prevails at Eyam. The same writer also affirms that the Staffords were formerly Lords of the Manor of Eyam, but in this he is in error. He also says that one of the chiefs of this family, in the reign of Richard the Second, was seized in his house at Eyam for some political offence, and remained in prison until ransomed by his friends. It is evident that the Staffords were very influential, and were large owners of land: Nearly all the property in the hamlets of Eyam, Foolow, and Bretton, comprising several hundred acres acknowledged them as proprietors. They were also Lords of the two Manors, and sole owners of Calver and Rowland. According to Lysons, John Stafford de Eyham was one of the Conservators of the Peace, for the county of Derby, in the 12th year of Henry the 6th (1433). The last male heir, Humphrey Stafford, was living at Eyam in the 11th and 33rd of Henry the 8th. His widow, Ann, was living in 1560. He had two sons, Roland and Humphrey, who both died without issue. His immense property was divided among his four daughters and co-heirs, of whom presently.
" Underneath is interred the remains of John Galliard, youngest son of Joshua Galliard, Esq., of Edmonton, in Middlesex, and Elizabeth, daughter of John Bradshaw, Esq., of Eyam, and Lord of the Manor of Abney. He departed this life April 29th, 1745". Richard de Stafford, of Eyam. Richard de Stafford, temp. John. Roger de Stafford, of Eyam, 12th Edward III. John de Stafford, of Eyam, 25th and 43rd Edward III. Robert, living 1st Henry IV. Roger, living 1st Henry IV. Nicholas, living 6th Henry VII. Roland, who died without issue. Humphrey, who died without issue. Alice daughter and co-heir, married John Savage, of Castleton, gent. ; he died in 1605. His wife inherited from her father a large estate in Eyam. This property was sold by his grandson, Humphrey. The title, a general one is in possession of Mr. Benjamin Bagshaw, of Foolow, and bears date 11th April, 1613. It recites "that for the sum of £1013 6s., Humphrey Savage, Esq., of Nor Lees, Hathersage (grandson and heir of Ales Savage, formerly Ales Stafford, daughter and heiress of Humphrey Stafford, Esq., of Eyam), sold his lands in Eyam to Thomas Middleton, Clerk, Richard Furness, yeoman, and a few others. The last of the Savage family was baptized at Castleton, 21st Nov. 1639. Mr. Bateman made additions to the pedigree from the Castleton register. Gertrude, daughter and co-heir, married Rowland Eyre, Esq., of Hassop. She had issue eight sons and four daughters. She died in 1624. She and her husband are buried in Longstone Church, where there is a brass to their memory, on which they are represented in a supplicating attitude. By this marriage the Eyres acquired the two manors of Calver and Rowland. The last male lineal descendant was Francis, the seventh and last Earl of Newburgh, of Hassop. Ann, daughter and co-heir, married Francis Bradshaw, of Bradshaw, in the county of Derby. She inherited the "hall of her fathers", and a large estate at Eyam, Foolow, and Bretton. This property is now in possession of her descendant, Eaglesfield Bradshaw Smith, Esq., of Blackwood House, Ecclefeccan, N.B. Katherine, fourth daughter and co-heir of Humphrey Stafford, married Rowland Morewood of the Oaks, Bradfield, Yorkshire. She brought to her husband an estate at Middleton Bank, Eyam, and Riley. This property was sold about sixty years since to James Furness, Esq. (of Stony Middleton and Sheffield), and a few others. Mrs. Morewood was buried at Bradfield, 16th July, 1595. The knightly and ancient family of the Gresley's, of Drakelow, are descendants of the Staffords through the Morewoods. One of them, the Rev. John Morewood Gresley, is the Rector of Overseal, in the county of Leicester. The Morewoods quartered the arms of Stafford of Eyam, "Or, a chevron, gules, between 3 martlets, sable". Joan, wife of John Meveril the Elder, had (4th Henry IV. ), the moiety of a messuage and two oxgangs in Riley, which she had by inheritance from William, her father. - a daughter, wife of Nicholas Leghs, of Eyam, held half of William Stafford's property, 6th Henry IV. John Stafford married Dionisia, daughter of William de Lynford, county of Chester, and had issue a son, John Stafford, who also had a son, Robert Stafford, county Lincoln. Stafford of Eyam, from Henry III. to Elizabeth. It has been shewn that the co-heiresses of Humphrey Stafford married Savage of Castleton, Eyre Hassop, Morewood and Bradshaw. The immediate descendants of the co-heiresses quartered the arms of Stafford, of Eyam, the same as those of Stafford, of Botham. We have seen a seal of Stafford, of Eyam, in the collection of Mr. Wolley, of Matlock Bath, with the following arms; Ermine, on a bend, gules, 3 roundels. The same coat was borne by Folcher, whose heiress married Bradshaw, and also by Botterill. PEDIGREE OF BRADSHAW, OF BRADSHAW AND EYAM. John, who married Isabell daughter of John Kinnersley, by whom ho had a son Richard, who died without issue. Godfrey Bradshaw, his heir, of whom hereafter. Henry Bradshaw, of Marple and Wybersly, now represented by the Bradshaw Isherwood's, of that place. This Henry Bradshaw had a son Henry, whose third son John was President of the High Court of Justice on the trial of King Charles I. See Ormerod's History of Cheshire. Francis, who had issue (was dead in 1625). He was uncle to Peter Bradshaw, of London, in whose will, dated 1625, his children had £30 each, one of whom, Lucy Cresswell, had £20 specifically. Anthony, of Duffield, and of the Inner Temple, London. He held lucrative appointments under the crown. He was twice married, and had no less than twenty children. His Prayer Book, with entries of his children's names, their births, baptisms and the names of their godfathers and godmothers (many of them leading people in this part of the country), is still in possession of Miss' Ward, of the Vicarage, Duffield, and his monument is in Duffield Church. John. 6. Richard. 7. Elizabeth. 8 Margaret. Leonard, had 100 marks by the will of his brother Peter. Ellen, married - Ash; her children had 100 marks under her brother Peter's will. Peter Bradshaw, citizen and merchant tailor, London. He married Amy, daughter of -- Johnson, of Watling Street, citizen and merchant tailor London, and had issue Edward, Peter, Francis, Paul, Thomas, William, and Elizabeh. His will is dated 23rd May, 1625. His nephews are sometimes styled cousins. Francis Bradshaw is an executor. His large estates in Ulster, in Ireland and at Duffield, Bonsall, Castleton, Litton, Fernilee, Combs, Bentley Mills, and herbages in Chinley and Maynstonfield, and Elsewhere in Derbyshire, Staffordshire, Leicestershire, and London, he divides among his children. His wife was sister to Lady Byrd. Humphrey. 3. Rowland. 4. George. 5. Peter; and several daughters. Francis, his successor: see below. Anne, wife of the Rev. Michael Adams, Rector of Treeton. She died 9th January, 1665. Francis Bradshaw, Esq, of Brampton , eldest son, died 29th December, 1617, without issue. Buried at Treeton. John Bradshaw, who died 10th June, 1656, in the first year of his age, and buried at Treeton. John, his successor, of whom hereafter. Elizabeth only daughter of Francis Bradshaw, died in London, 28th August, 16--, and buried at Treeton, 4th September following. George Bradshaw, Esq., married Ellen, daughter of Robert Roper, of East Derby, county Lancaster, had issue one son James, who died an infant. George Bradshaw, buried at Doncaster, 15th December, 1735. John. 3. Margaret, died 1682. 4. A second Margaret; all died without issue. 5. Elizabeth. Joshua, eldest son, who died an infant. John, died 20th April, 1745. Buried at Eyam. Elizabeth, married Arthur Beardsley, of Nottingham. Dorothy, married John Richards, of London. Bradshaw Galliard, son and heir apparent. Died without issue in his father's lifetime, and intestate, September, 1785. He was author of some poetical works. Eaglesfield, his successor, of whom hereafter. Mary, daughter and co-heir, who inherited Bradshaw Hall Chapel- en-le-Frith, with the manor or Lordship of Abney. She married Charles Bowles, Esq., of Radcliffe, county Middlesex. The present Rev. Humphrey Bowles is the representative of this branch of Stafford, Bradshaw, and Galliard. At Eyam very little is now known of the Bradshaw family, excepting their connection with the place as landlords. The pedigree clearly establishes the relationship between the Eyam branch and that seated at Marple, from whom the celebrated President Bradshaw descended. It will be seen that his elder brother Henry took an active part in the events of that period. He married Mary, daughter of Bernard Wells, of Hope, by whom he acquired Wyberslegh Hall. His name is the first to the Cheshire petition to the two Houses of Parliament, 6th July, 1646, praying for the establishment of the Presbyterian religion. He was Colonel of the Macclesfield Hundred Militia, and was at its head at the battle of Worcester, where he was wounded. In 1652 he was one of the Court Martial on the Earl of Derby, at Chester, and on the petition of the Countess of Derby, he was summoned to appear before the Lords' Committee, to which the Countess's petition had been referred. On this occasion he was confined, in the house of Thomas Lee, a messenger of the Black Rod, from the 17th July, to 14th August, 1660, on which day the said Colonel Bradshaw, Henry Bradshaw, of Gray's Inn, and Cromwell Meverell, of Tideswell, were bound in £500, to Alexander Thane, Usher of the Black Rod, for the Colonel's appearance. There were at Marple several forms for an apology or answer to the charge against him. In these documents he calls the President his brother. Colonel Bradshaw obtained his release, as appears by a receipt for £40, dated 14th August, 1660, signed Alexander Thane, for fees duo to him as Usher of the Black Rod, from the said Colonel H. Bradshaw, during his confinement; and by another signed Cromwell Meverell, dated 23rd February, 1660, for the Colonel's pardon sueing out, and 30 shillings paid to the Master of the Black Rod, as a gratuity on the delivery in of his bail book. On the l 5th March following, the said H. Bradshaw was buried at Stockport. This branch of the Bradshaw's is now represented by the Isherwood's, of Marple Hall. It is asserted that there are no less than fourteen Bradshaw Halls in different parts of the country, all of which have, at various periods, been inhabited by members of the Bradshaw family. The pedigrees of Stafford and Bradshaw, have been collected and compiled from various sources. Mr. Birds, of Eyam, Michell's MS., Flower and Glover's "Visitation", the late Mr. Bateman, Mr. Ince Wakefield, Mr. Wright, of Tamworth, Ormrod s Cheshire, and Hunter's South Yorkshire. See monument in Alfreton Church. "Pedigree of Savage, of Castleton in le Peke" - Flower and Glover's Visitation. i. Elizabeth Macdowal Walker is believed to be incorrect, and in fact according to the IGI, an Eaglesfield Bradshaw SMITH married an Elizabeth Macdonald LOCKHART on 30 Aug 1838 at Braddan, on the Isle Of Man. The Will of Norman LOCKHART (1853), taken from the Scottish Archives, refers to his daughter Elizabeth Macdonald, wife of Eaglesfield Bradshaw SMITH Esquire, of Blackwood House. ii. The sasine dated 15 August 1855 when David Souter ROBERTSON bought Tarbrax Estate from the trustees of Norman LOCKHART refers to “Eaglesfield Bradshaw Smith Esquire of Blackwood House in the County of Dumfries”. 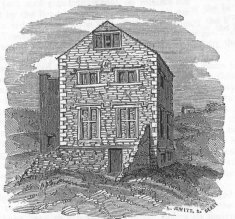 See also the chapter on Bradshaw Hall in William Wood's ‘History and Antiquities of Eyam’.